Swift is an innovative e-learning services company that provides end-to-end eLearning Solutions to corporates, academia and training providers in india and throughout the world. As eLearning companies, we design learning solutions, custom elearning development that are tailored to meet your unique business needs that results in change behaviors or improved job performance. We believe in learner-centric approach and immersive learning experiences with custom elearning courses relevant scenarios, gamification and other instructional strategies. 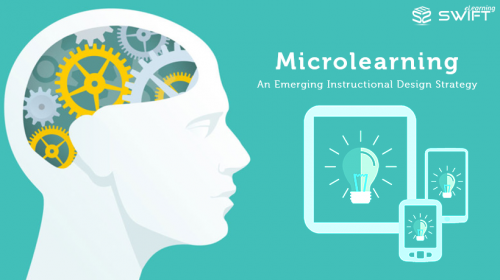 Microlearning is an emerging instructional design strategy and has been a buzzword both in eLearning Industry and Learning & Development landscape. In this blog, we will dive deep into microlearning to find its characteristics. Today’s millennial workforce is overwhelmed, distracted, stressed out and disengaged more than ever. And this younger generation wants to have a complete control over what they learn, how they learn and when they learn, provided the learning is completely relevant. Given their low attention spans and heavy distractions, long and boring content (aka information dump) makes no more sense in the present context. So it’s time to design eLearning with a more holistic learner-centered approach, and that’s what we call “Microlearning” (micro-learning or micro learning). It is an ideal eLearning solution for corporate learning environment that supports blended learning / mobile learning strategy / formal training. Microlearning is a learning strategy that involves bite-sized learning nuggets (small and focused segments) designed to meet a specific learning outcome. To put it simply, the learning content is chunked to reduce learner’s cognitive overload making it easy for learners to absorb and recall. And this results in better learning retention. On top of that, it is easily accessible via mobile devices providing just-in-time performance support. Microlearning could be anything that provides a brief learning experience. For instance, it could be a mini eLearning module with a smaller chunk of learning content or a video tutorial or even a quiz or an infographic. How Does an Effective Microlearning Course Look Like? Well, microlearning is going to be one of the hottest eLearning trends in 2017. Most of the organizations have already started implementing microlearning as part of their corporate learning culture. Are your training strategies not meeting the current learning requirements? Are you unable to keep your modern learners engaged? Then it’s time you switch to microlearning for a more targeted learning and performance support. After all, training programs need not be boring and tedious. We, at Swift, help you devise better microlearning strategies that fit your learning culture whilst driving your learning and development programs with the better completion rates. This means a better eLearning return on investment (ROI) with better business results.